First, I have very little experience with compressor pedals. Second, the Ego compressor was not some new release for the Nashville Amp Expo. Wampler Pedals actually had a pretty cool high-gain distortion pedal they were demoing for the first time at the show. The SLOStortion is a surprisingly thick sounding distortion pedal. Not entirely my cup of tea for blues, but I was surprisingly intrigued by it's beefy tone. I spent a good amount of time in the Wampler room trying out the pedals, mostly playing through their compressor pedal called the Ego. I've never used a compressor pedal in my signal chain because it felt like cheating. Maybe cheating is the wrong word. I just felt that compression should come from the amp as the tubes are overdriven, so a compressor pedal SHOULD be un-necessary. However, a clean amp played at relatively low volumes is an exceptional case. The tubes aren't adding any compression of their own, so it's not the "clean" that bothers me, just the lack of sustain. At loud volumes, a clean amp will cause the strings to sustain more, but a clean amp at low volumes is rather plinky. A compressor pedal, I theorized, could help solve some of this by adding more sustain to the notes. But I didn't want to lose the snappy attack, especially for those plucked Albert King style bends. So I kind of wanted the best of both worlds. 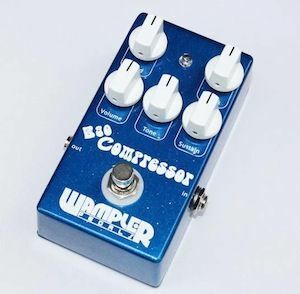 At the Amp Expo, I tried out the Ego Compressor from Wampler, and was delighted to find that it has a "blend" control. This blend allows you to mix the compressed signal from the pedal with the uncompressed original signal. So you retain the snap of the initial picking attack, but your notes will sustain longer, to the degree that you've mixed in the compressed signal with the "Blend" control. I am in no way a connoisseur of compressor pedals. So when I bought the Ego, I had not done a ton of research on competing pedals. But it did what I wanted it to do, and sounded very transparent. Good enough for me, and I like it quite a bit. When I'm done with my next lesson series I'll be doing a full review, but the video from the show should reinforce some of what I've written here.